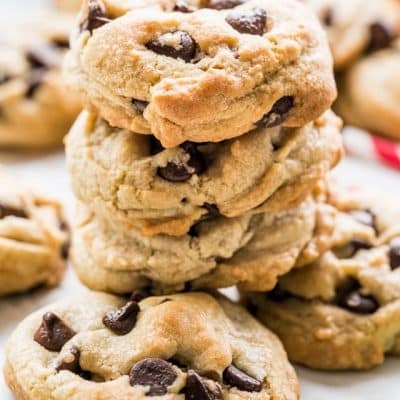 These Chocolate Chip Cookies are my go-to cookies for whenever we have a sweet tooth or want something yummy and quick. They’re chewy, soft and simply the best chocolate chip cookies. Nothing beats a good batch of freshly baked cookies coming out of the oven. The smell of freshly baked cookies is enough to make me hungry and I can’t wait till the cookies are cool enough to pop a couple in my mouth. 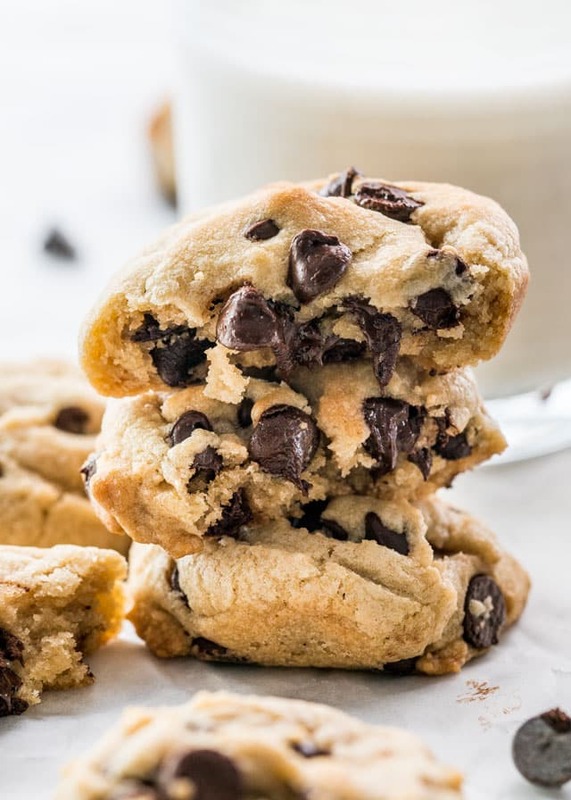 These chocolate chip cookies are soft, chewy, loaded with chocolate and simply comforting, especially when paired with a cold glass of milk. 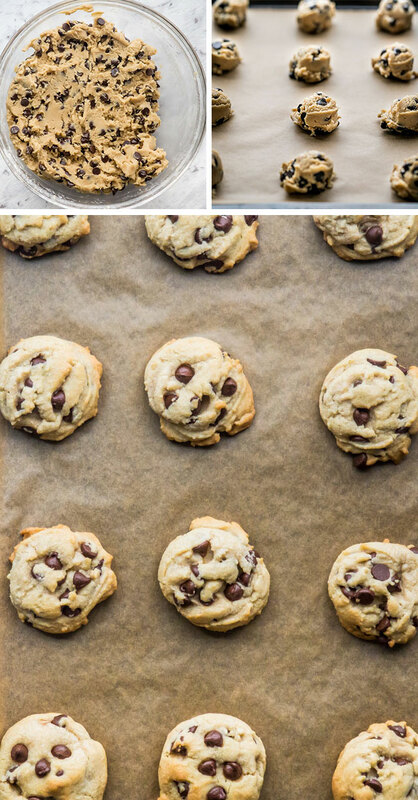 This is our go-to recipe for chocolate chip cookies for the past 8 years or so. I once received a Christmas card from a vendor I had worked with. Inside the Christmas card was this wonderful chocolate chip cookie recipe which was titled Best Ever Chocolate Chip Cookies. Now who am I to argue with this? I thought it was really nice of this lady, and I loved the idea of giving someone a recipe for Christmas. Well, time went by and I never made these chocolate chip cookies, because personally I prefer oatmeal cookies. 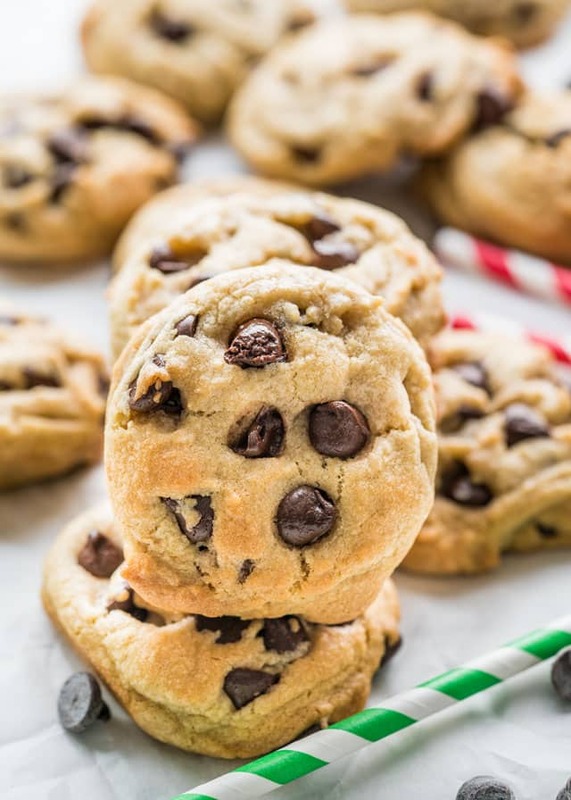 In the back of my mind, I knew this cookie recipe existed, and I wanted to make this some day to see if it truly is the best ever chocolate chip cookie recipe. I had my doubts back then, but when I finally gave in, I was pleasantly surprised. Not only that, but my extremely picky husband loved them and did say this was the best chocolate chip cookie he had ever had. Ever since then this is pretty much the only chocolate chip cookie recipe I ever make. Always use butter and not margarine. Although many recipes call for softened butter I find that melted butter helps spread the cookie more and give you the perfect cookie every single time. Do not ever grease your cookie sheets. I always line them with parchment paper and this way there’s no cleaning required afterwards. Use a cookie scoop to form your cookies. Make sure you DO NOT over bake your cookies. Keep in mind that they will continue to cook once you take them out of the oven. 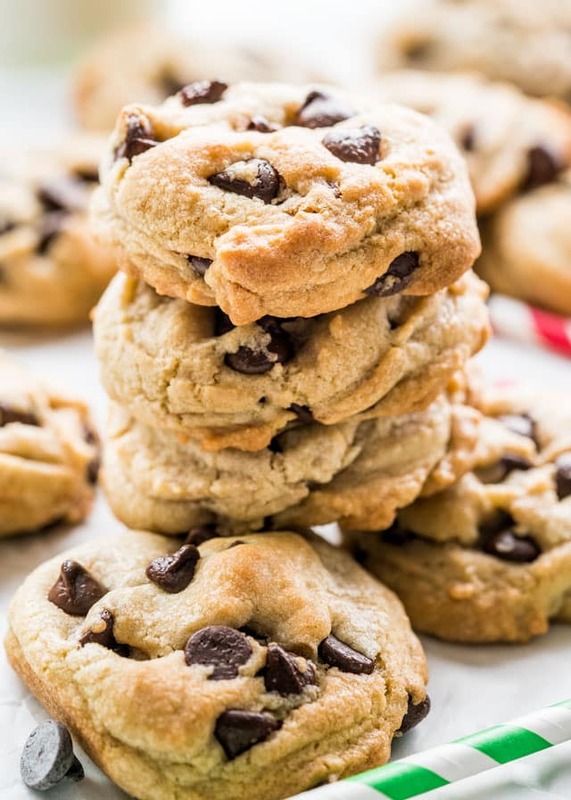 These Chocolate Chip Cookies are my go-to cookies for whenever we have a sweet tooth or want something yummy and quick. They're chewy, soft and simply the best chocolate chip cookies. Nutrition: Nutritional information assumes recipe will yield 50 cookies. Please keep in mind that nutritional information is a rough estimate and can vary greatly based on products used. Love this recipe! How long do the cookies last though before they get spoiled after you’ve cooked them? I just place them in the cookie jar on the kitchen counter. About a week? Store them in an airtight container, and they will stay soft and chewy for about 2 to 3 weeks at room temperature. Everyone loves these cookies, but they get flat, not like those in the recipe, what is the secret, i followed the recipe to the gram, is it the oven temperature? Please help me, because what i really enjoy in them is the softness, wich I think it could improve with them “taller” or higher, and not so flat. That’s very interesting! We’ve never had an issue with these cookies flattening out. Every oven is different, even at the same temp. An oven that is too hot can cause spreading, so try out a lower temperature. Firstly I’ll try the 375F (190ºC), because I´m used to bake most things in 180ºC, and this happened and I’ve lowered it to 170ºC and it was the same result, so I´ll try the original temperature. By the way, I use margarine, instead of butter, because i’m lactose intolerant, so, should I change the amount of any ingredient? So using margarine is definitely what’s making your cookies flatten out. You’ll have to make sure the margarine is at least 80% vegetable oil or 100cal per tablespoon. When margarine has a lower fat content, cookies tend to spread while baking. on my way to the supermarket… away Silver away!!! No- the recipe doesn’t call for baking powder. It calls for all-purpose flour and baking soda. Enjoy! Super delicious. Throwing out my tried and true recipe and replacing with this. Comes together in a snap. That’s great to hear, thank you Joy! Since moving several times in the past year, my go to recipes were unfortunately misplaced and I’ve yet to find them for Christmas cookie season! I figured I’d try this. The first time I made them, I doubled the batch and completely forgot to double the butter in the recipe. They had to bake a bit longer and turned out less soft, but were a good chewy texture. I took them into work (not realizing my mistake at that point lol) – everyone LOVED them regardless. Good to know in the future if I’m low on butter. The second time around, I figured out the mistake and finally the cookies turned out as they should. They were perfectly soft like I love them! Definitely will continue to use this recipe in the future. Truly a wonderful recipe considering how forgiving it is to such major blunders. I’ve never tried another chocolate chip cookie recipe after this. Nothing beats it. These cookies are amazing. I made them today and the fam loved it. Super easy and virtually failure-proof. I cut down the amount of sugar by more than half but feel like I could have cut down even more because the chocolate chips are so abundant that they provide a lot of the taste anyway. Great recipe, thanks Jo for clear, easy to follow directions and excellent tips. 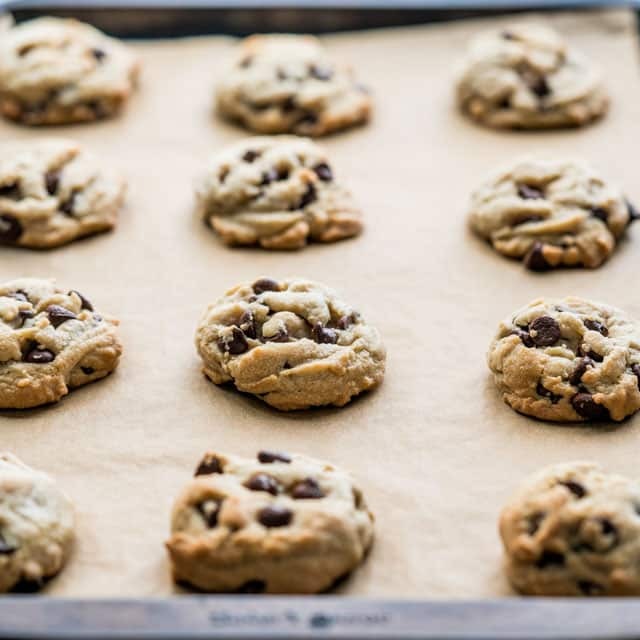 Chocolate chip cookies are my husband’s favorite, and I have tried many recipes. I plan to give these a go next week. What size cookie scoop do you use to get 50 cookies? It’s not the very small one, middle size one, I believe it has a capacity of 1.3 oz. I just made a batch of these cookies this morning. They are beautiful (really pretty) and the best cookies ever. Thanks for sharing. I always melt my butter when making sugar cookies but never thought to do it with chocolate chip. Plus, I bought a cookie scoop (2 tbsp) so they are uniform and lovely! This was the best chocolate chip cookie recipe ever! I am sure my boyfriend will agree! Oh I sure he will! It really is the best. These cookies have been a hit with my entire family! I have to double the recipe every time I bake them as I also send them to my son in the Air Force, and my other away at college. My father now sends me texts to let me know he has finished his container as well! I could bake these every weekend and still run out! If I had a larger Kitchen-Aide I would triple or even quadruple the recipe. That is the sign of a great cookie. I add both semi-sweet and milk chocolate chips as we love our milk chocolate. Thank you not only for the great recipe but for the helpful tips as well. I have become the mom who bakes “the best cookies ever” and I love it! Great recipe. Had to half the recipe ingredients because I only had half cup of butter. They turned out great still! Thanks! I’m making these for my husbands boss and colleagues…. not my ideal time to try a new recipe but this one has turned out great! I doubled the vanilla and used a bit more flour, also I did 1/2 semi sweet chip and 1/2 milk chips! This is my go to chocolate chip cookie recipe. I’ve made it a dozen times and I love it. Super simple and easy. Do not overbake! I take them out at 9 mins, let them cook on the sheet (so they slowly cook a little more inside, and then place them on a cooling rack. My cookies always turn out super gooey! These are amazing! Perfect, like from Baked or Chip! So thick and the texture is perfect without it tasting like flour. I only have good things to say about this recipe. For half the batch I made I mixed in a little cocoa and hazelnut chocolate spread. So tasty!